Jeff Pierini, an SCE reforestation specialist and wildlife biologist, uses a tool called a dibble to plant seedlings around Shaver Lake. The green seedling in the center of this photo is dwarfed by stump of a pine tree that was cut down. An SCE worker tamps down the soil around a new seedling he just planted. 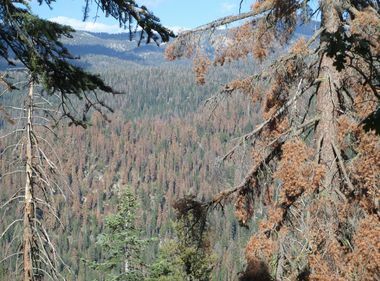 The beetle infestation in the Sierras has so far killed 102 million trees. This is the building in Auberry where SCE raises its seedlings for the reforestation of Shaver Lake. The goal is to plant 100,000 native ponderosa pine and sugar pine seedlings a year to return the forest at Shaver Lake to its native habitat. It’s been a painful year for the foresters and biologists in the Sierra Nevada. 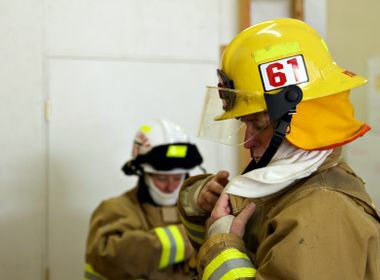 What began as a slow die-off of trees over the past few years accelerated alarmingly throughout last summer, heightening the danger of wildfires. 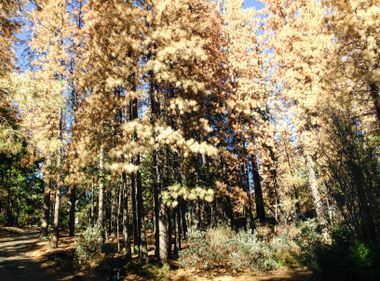 By November, the U.S. Forest Service estimated 102 million trees on 7.7 million acres of California’s drought-stricken and bark beetle-infested forests had died, with no end in sight. But in a tiny corner of the Sierra, at Shaver Lake east of Fresno, there is a ray of hope. Southern California Edison is ramping up its reforestation efforts on the 20,000 acres it owns in the Sierra. SCE staff has been planting 40,000 native ponderosa pine, sugar pine and giant sequoia seedlings a year for decades, but with the seriousness of the die-off, the total will jump to 100,000 starting next year. “It’s our chance to jump start the forest,” said Jeff Pierini, an SCE reforestation specialist and wildlife biologist, who helps oversee the work. “It’s our chance to jump start the forest. SCE’s reforestation efforts date back almost a century to when the utility first bought the land from the Fresno Flume & Lumber Co. as part of its Big Creek hydroelectric project. SCE eventually built its Forest Tree Nursery in nearby Auberry to grow the seedlings for replanting. The reforestation work is a multi-stage process spread throughout the year. In late summer, SCE’s forestry staff and a few volunteers harvest pine cones from the trees. They often hire a tree climber to reach the higher limbs of the oldest trees, which can soar 110-120 feet high. After testing the seeds for viability, they store them in a cold, dry place for the winter to replicate the forest conditions outside, and then they are planted in Styrofoam cells to grow. Once the winter weather passes and conditions are right, about a dozen SCE staffers in two-person teams plant the 8-inch seedlings. Once the planting ends, they wait for a new harvest season to collect seeds for the next crop. Although SCE only owns a tiny portion of the Sierra forest, SCE forester Ryan Stewart calls the reforestation work an important contribution, noting that over the upcoming years, hundreds of thousands of trees will be planted.